What is all the fuss about coconut? Nowadays, coconut products can be found everywhere. Consumers are eating more coconut products than ever; coconut water, coconut butter, coconut milk, coconut yoghurt and coconut sugar are filling the shelves of supermarkets and health stores. If you don’t want to eat it then rub it on your skin, chew it or feed it to your dog. In our house we do consume a fair amount of coconut. We use coconut water in our smoothies, coconut oil for cooking and baking and we just love using freshly made coconut milk to prepare an authentic South Indian curry. But is it actually that good for you? What are the healthiest forms? Are there any limits on how much you should have? And what about the farmers, do they get a fair share too? We wanted to know more so here’s what we found. The word coconut comes from the Portuguese ‘coco’ which means goblin or monkey because the marks on the stem resemble a monkey or human head. Coconuts are thought to have originated from the western Pacific and were spread by humans and ocean currents all over the tropics. Now coconut trees are grown in more than 90 countries throughout the world and about 20 billion nuts are produced each year in the Philippines, India and Indonesia. India is the third largest coconut producer in the world, Kerala being its most fertile state for growing young coconuts. A recent DNA analysis of over 1300 coconuts from all over the world revealed that the coconut was first cultivated in two separate locations, one in the Pacific and the other in the Indian Ocean. Also through the coconut DNA they were able to trace human cultivation, voyages of exploration, trade and colonization; which we thought is pretty astonishing for a coconut! The coconut has nourished populations around the world for generations. It is a unique and immensely versatile nut that provides a nutritious source of fats, it has a unique potable water, it can be used to make a rich cream, flour, sugar, alcohol, moisturizer, soap, toothpaste, deodorant, sunburn lotion and even furnishings and rope. It is little wonder that it has deep cultural and religious significance in the societies where it is grown. Nearly one third of the world’s population depends on coconut to some degree for their food and their economy. Over 10 years ago, the only way to enjoy a drink of fresh coconut water was to get on a flight to an exotic location. Nowadays coconut water has filled the shelves of every store and is a billion dollar industry. Coconut water is sold as a health drink due to a high content of potassium, magnesium, Vitamin B and Vitamin C. It is low in sugar but high in micro nutrients and electrolytes which keep the body hydrated and make it a perfect drink for athletes and hang overs. However unless you are buying fresh green coconuts and getting the water directly from them, the chances are that your coconut water is nowhere near as healthy as people claim; here’s why. – Fresh, raw coconut water is very delicate and only keeps for a couple of days in the fridge so in order for companies to sell prepacked coconut water they have to find a way to preserve it. There are two main ways they can do this. The first is UHT (Ultra High Temperature), which kills off any bacteria and also the majority of the nutrients, the vitamins and the natural enzymes which make coconut water so good for you. The second method is HPP (High Pressure Processing), which is a heat-less process which inhibits the bacteria while keeping the nutrients in tact. Pretty much all coconut water sold as ‘raw’ uses this process. – A lot of companies use water from mature coconuts (not the young green ones) because it’s a cheap byproduct of the coconut oil industry. The problem with this is that all the nutrients have gone into the flesh of the coconut so the coconut water you are drinking has very little nutritional value. It also tastes acidic so they have to add sugar or flavourings to mask the acidity. Pretty much any coconut water with added sugar is sure to be from mature coconuts. – A lot of it is made from concentrate which, like fruit juice from concentrate, has practically no nutritional benefits whatsoever. – Also be aware that these days coconut water is big business, ONE is owned by Pepsi Co and Zico by Coca Cola. However there are small companies that provide high quality, organic, raw coconut water but you have to search for them, here are some we found in the UK (Coco Juice, Unoco and CocoFina). There are also several shops now selling whole fresh, young coconuts which you just take the top off and stick a straw in for a guaranteed super healthy refreshing tropical drink. There is a fantastic article here by Vani Hari detailing the best and worst coconut water manufacturers. Natural coconut oil is made of 90 percent saturated fat (butter only contains 64 percent saturated fat), but the type of saturated fat matters just as much as the amount. Coconut oil is composed predominately of medium-chain fatty acids (MCFA), also known as medium-chain triglycerides (MCT), which are much easier for our bodies to digest and turn into energy than the long-chain fatty acids (LCFA) typically found in meat, dairy and eggs. 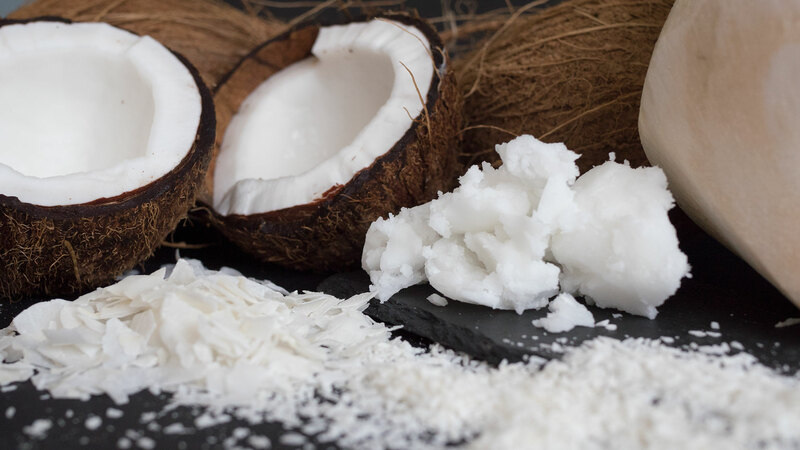 Furthermore 50% of virgin coconut oil’s saturated fat is lauric acid, which is a MCFA that turns out to have a number of health-promoting properties, including the ability to improve levels of “good” HDL cholesterol. 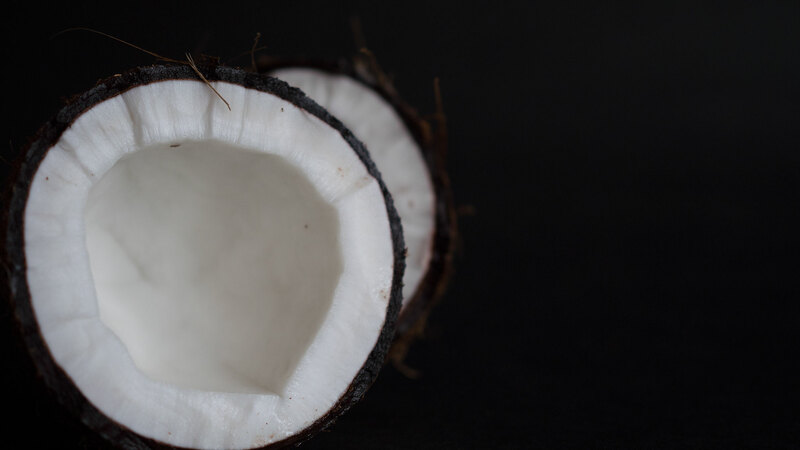 Your body converts lauric acid into monolaurin, which is claimed to have high anti-viral, anti-bacterial properties and coconut oil contains the most lauric acid of any substance on Earth! The smoke point of coconut oil is quite low, similar to butter or lard, so it is not good for frying at high temperatures. You can get unscented coconut oil but this goes through heavy refining and is often bleached so is best avoided. Like all oils the best and most nutritious forms are virgin, cold pressed and organic. Generally because it’s so high in saturated fat, even the purest, most natural coconut oil could be problematic for long term heart health. Coconut oil is not a miracle food and should be eaten as part of a well balanced diet. If you have a meat heavy diet go easy on the coconut oil, however it is a fantastic source of good saturated fats for someone on a vegan diet. Coconut cream and milk, which are so popular in Thai and Carribean cooking have all the MCFA saturated fats found in coconut oil along with the fibre, vitamins and nutrients. It is important to remember that not all coconut products are the same and many of them are highly processed and contain added sugar. If you want to get the maximum nutrients and a fantastic taste we recommend you make your own coconut milk. It is really easy and it tastes so much better than anything off the shelf. Here is a video we made to show you how. The other main product from the coconut tree is the nectar. This has nothing to do with the nut but is the sap of the palm that is tapped from the coconut blossom. It has been traditionally tapped for centuries throughout the tropics. It is then heated to evaporate the moisture content. You can either leave it in this state for the runny nectar or it can be further reduced to reach a crystalline sugar form. It is claimed by the Phillipines Coconut Associated that it has an incredibly low glycemic rating, almost half that of brown sugar. It does contain some minerals and vitamins, but much like honey the amount you have to eat to get any meaningful nutrition out of it would practically kill you. Primarily it has the same amount of calories as brown sugar and should be eaten with moderation. If you want a sugar alternative we recommend you use locally sourced, raw honey rather than shipping in coconut nectar from the other side of the world. We do love coconuts and the many marvelous products you can make from it but at the end of the day it is a tropical product that takes a lot of time and work to grow and has to be shipped a long way so should be treated as a luxury product. Over the last decade coconut producers have seen a massive increase in demand from the Western world. But this has not helped the livelihoods of the farmers. Most coconuts are still grown on small and medium plantations. 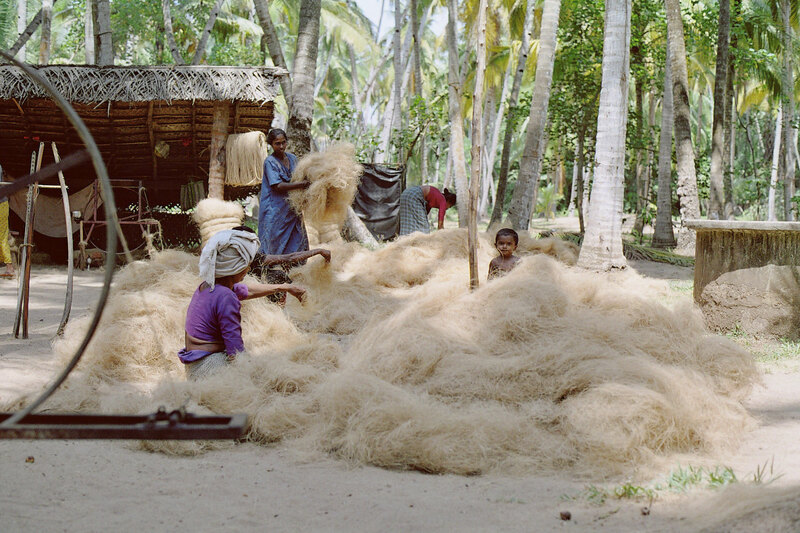 The labour of coconut farming is hard and there is very little mechanization involved. The farmers only receive a small portion of the revenues from selling coconut. As Frederick Schilling mentioned in the Times (“Why the Coconut Craze Isn’t Helping Farmers”) ‘a farmer will sell his coconut to the general market for $0.15 to $0.25 per coconut. A tree will produce anywhere from 30 to 70 coconuts per year. So, in one year, a tree will give a farmer a maximum income of around $17.50. Think about how many trees a farmer must have in order to make a decent living.’ There are many farms now that grow another product, very often cacao in the shade of the coconut trees which allow them to double the yield of their plot of land. Like all these things it is best to do a little research on the companies you are buying from, always buy organic and look for Fair Trade or transparent ethics. You will be supporting a sustainable future for the growers and the environment and you will inevitably end up with a higher quality product that is better for you.